There are several Queens in history who have been largely forgotten and I always applaud any book that attempts to bring these women to the surface. Forgotten Queens in Medieval and Early Modern Europe has chapters on Queen Gwendolen – a legendary ruler of ancient Britain – the women of the House of Wessex in the century after the Norman Conquest, Berengaria of Navarre and Joanna of Sicily, Maria of Navarre, Katherine Howard, Katarina Jagiellonica and Sophie of Mecklenburg-Güstrow, Elisabeth of Austria and Marie-Elisabeth of France, Catherine of Braganza, Marie Leszczinska and lastly, Maria Carolina of Austria. Overall, I enjoyed the wide variety of subjects but I was surprised by how at least two of the authors admit that “their” Queens hardly count as forgotten Queens. It seems like a strange comment and does not fit with the point of this book. Though it seems to be primarily aimed at the academic world, it is quite readable even without having an academic background, but some of the essays are a bit dry. 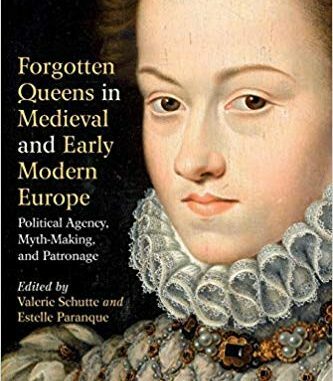 Forgotten Queens in Medieval and Early Modern Europe edited by Estelle Paranque and Valerie Schutte is available now in both the UK and the US.